Secret Lives is an ongoing series that shares the unusual past careers and unique hobbies of OhioHealth associates, physicians, and volunteers. Thomas Fesler, MS, PhD, is a man of many talents. As director of environmental and linen services for OhioHealth MedCentral Hospitals, Tom oversees housekeeping, office relocations, basic furniture repairs and laundry for Mansfield Hospital, Shelby Hospital and other care sites. With a PhD in Education and a master’s degree in Education and Healthcare Administration, Tom also knows how to teach. From 2005 to 2012, he taught elective courses at the MedCentral College of Nursing — now a part of Ashland University — instructing future nurses on approaches to long-term care, aging and the dying process. But it is Tom’s two previous roles that reveal his unusual range of skills and adaptability. Prior to his work at the College of Nursing, Tom drove a transit bus in the evening on Park Avenue West for 10 years. Around the same time, he also ran a youth ministry program for 170 junior high and high school-aged children on behalf of Lexington’s Resurrection Parish. Tom, now 47, explains he got involved in youth ministry during his twenties at the request of the parish priest. Between 1992 and 2002, he worked part time organizing all of the youth programs — from Catholic education to food drives — and traveled close to 70,000 miles on field trips around the country. He even got within a few feet of Pope John Paul II on a trip to Toronto during World Youth Day in 2002. As the man responsible for transporting youth in the parish bus, Tom wanted to keep his driving skills up to par. So, when he heard Richland County needed part-time bus drivers he thought, why not? What he expected to be a temporary position turned into 10 years. 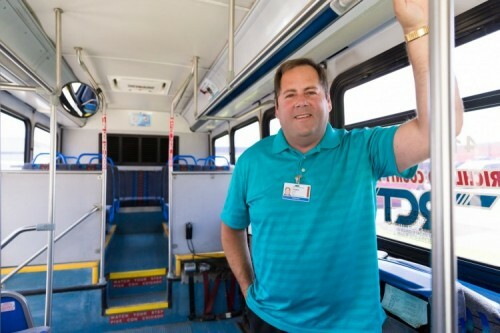 Tom says he loved getting to know his passengers and helping handicapped people use the bus, even though he faced a few less-than-enjoyable encounters, including some aggressive patrons and the occasional fare dodger. “Working in public transportation and with kids in youth ministry, it really helped me be a good communicator working with people from all walks of life,” he says. There’s no such thing as time off for Paul Tomcho, RN, an Emergency Department nurse at OhioHealth O’Bleness Hospital, and his wife, Krista Duval, DO, who works in the hospital’s Wound Care Center. When Paul and Krista aren’t caring for patients, they’re busy tending to their 22 goats, 70 chickens and 1,000 berry plants on their farm in Athens, Ohio. The couple started their farming business three years ago after purchasing an abandoned 90-acre property. Both grew up knowing family members with farms, and Paul had worked on dairy and vegetable farms after graduating college. They initially planned to raise cows, but decided goats would be more of a niche market. Today, Paul and Krista have a fully licensed dairy facility where they process approximately 150 gallons of goats’ milk each week into cheese, yogurt and soap. They sell the products and berries at farmers’ markets and stores. It’s a big job, and they do all of the work themselves from milking the goats, to addressing veterinary needs, hauling water, picking berries, marketing and selling. Krista says working on the farm is more physically challenging than her work as a physician, making it a good counterbalance. It’s also an opportunity to spend time with her husband doing something she loves. The couple has found that there are tie-ins to healthcare, too. Both say caring for animals and plants — who cannot speak up if something is wrong — has made them more observant of their patients. This story was originally published in the September/October 2015 issue of UpFront, an OhioHealth associate publication.